Cruising the FTW blog rolls and internet this week, I found some interesting things from members who have used what they found on From the Warp to help them with their hobby. Stuff I figured I'd pass along to you guys to check out to see what they're doing with the info they pick up here. I'd built my conversion a long time ago and he was a big hit with Raven Guard players. It was cool to see how The Golden D6 used the post as inspiration to put his conversion together. He even went further than I did and scaled him up some to make the model larger than your average Space Marine. I think the biggest thing when doing something like this is that you're challenging yourself to build something to fit what you imagine and not what GW or someone else gives you as what the model should look like. Whether or not it turns out the way you want, just the process of building it can expand your hobby horizon more than you know. You can see a handful of his WIPs here in his conversion post. I'm one of those guys who paints his power swords plain metal. I know, it's a cop out, but I'm picky when it comes to adding extra effects like lightning and such. That and I'm not the best at it either. 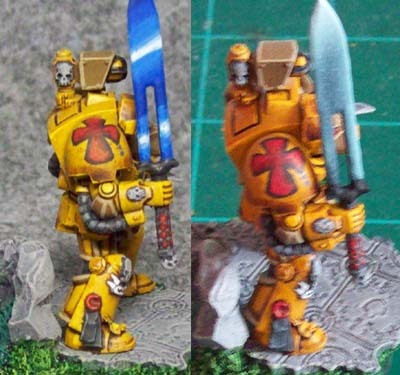 When I found this post by Scratchbuilt 40k, I saw the effect he did on his power swords and while it worked, it just didn't match up with the rest of his painting. One comment later, he'd reworked them and I think they look a hundred percent better and fit in with the paint scheme much better now. Not that the previous technique was bad, just a bit over the top and it clashed with his muted yellow armour (which is very hard to do). The new powersword (on the right) looks much better in my opinion and feels like it fits in overall. You can see a few more pics in his post here. After seeing this finished beuty, I was amazed Iron Braxus did it all with a brush. He says it's because he picked up the trick of thinning his paints, but I think that's only part of it. There's a lot of work that goes into a model like this (I've built something similar) and painting is only part of it. I think the combination of the OSL, the glowing cockpit and the color scheme all come together to make a great looking model. Even more important for me is that the model just feels very Eldar and becomes believable. You can see more pics of the finished model here. As an added bonus, fellow Blogger 3+ FTW has come up with some unofficial rules for Inquisitor Samwise, Herald of the Rending Pony. 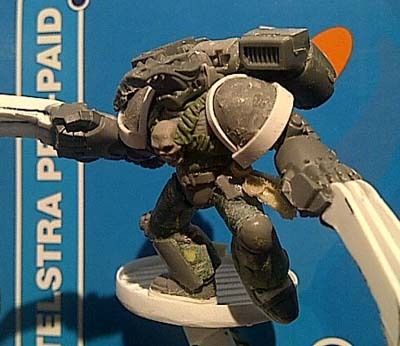 Image from GW, might this be the model he will be basing his conversion on? You can see his unofficial rules here in his post. The Actual Rending Pony Apocalypse Datasheet can be found here. I absolutely agree that my first power sword was a stylistically poor choice and was distracting from the rest of the model and the mood it conveyed. The second image is definitely more fitting with the grim dark style of the army's paint scheme. The Golden D6's conversion is fantastic and amazes me! My next foray into the unknown might be to attempt to be better at using the stuff. I've been thinking of repainting the Eldar and this Lynx is downright inspiring. Krisken: But it looks a ton better now and that's all that matters. Besides, your guy is painted yellow... the most I've ever painted yellow was a powerfist and that was plenty for me. The Shrike conversion is nice... and it's scaled up in size too which is a tremendous amount of work. And the Lynx, it's a gorgeous tank that just oozes Eldar doesn't it. 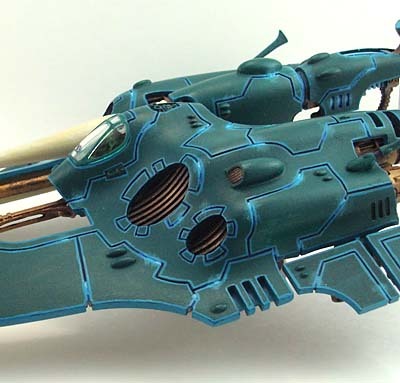 I don't know if it was intentional or not, but I love how the painting on the Lynx echoes the style of the Necron metal. Fitting that the two most advanced races in the galaxy would have similar-looking materials (especially given their Best Friends Forever status). Ron: Thank you for the advice, and the kind words! I really appreciate being showcased here! Also, I forgot this previously, the power swords are MUCH better looking now I think. Though, don't lose that skill at the NMM looking blue. It would be awesome elsewhere I am sure of it! I have to agree, the power weapon looks much, much better in the second picture. Fayte: No problem! Thanks for letting me get on my soap box. Thanks for the link. It's stuff like FTW that leads some of us to bigger and better things. Well written, documented and picture laden posts make you realise that things you believe are beyond you are definitely possible, even if it does take a couple of goes! That Lynx was done without a paintbrush!? Wow! By the way, this sounds dumb but:how do I access the FTW blogrolls? I can't find them anywhere on the blog. Adam: Thanks for the kind words. There's lots of great stuff out there, I'm just trying to show people they can do it too. 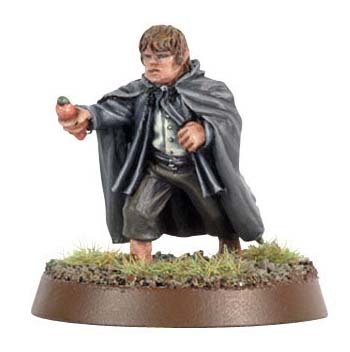 The Green Farseer: Yep, no airbrush. Looks great doesn't it? Eldar vehicles are tough to begin with, but a Lynx is bigger than your average vehicle so I can only imagine the issues encountered. The FTW Blogrolls have not been reposted on the site yet. I had a temporary version posted the other week for a few hours to troubleshoot (I was running them through Feedburner). Unfortunately, that's not going to meet the need that I have here. It is still being worked on, but I fear I'm not going to be able to solve it to everyone's liking.